Scaling and root planing eliminate plaque and bacteria buildup from hard-to-reach areas below the gum line that routine at-home dental care cannot address. Dr. Jon Marc Van Slate uses this technique at our Houston, TX, dental practice as part of a deep cleaning to treat gum disease when it is in the earliest and most manageable stages. When caught early, the side effects of gum disease are often reversible. However, when left untreated, the disease is chronic and can lead to serious oral and physical health conditions, such as tooth loss and diabetes. However, when left untreated, the disease is chronic and can lead to serious oral and physical health conditions, such as tooth loss and diabetes. Although this condition has been known to cause tooth loss and jawbone deterioration, it can also have a negative impact on your overall health. When gum disease reaches the most advanced stages, it can increase your risk for developing diabetes, heart disease, and stroke. However, gum disease is preventable with a routine dental cleaning and examination every six months. During your consultation, Dr. Van Slate will perform a thorough examination and cleaning with the latest dental technology to review the health of your teeth, gums, and jawbone. If the early stages of gum disease are detected, Dr. Van Slate will recommend a scaling and root planing treatment. Before beginning treatment, he will administer a topical or local anesthetic to numb the gums and surrounding tissue. Using the latest dental instrumentation and techniques, he will remove plaque and bacteria buildup from the surface of the tooth, below the gum line, and in between teeth with a scaler. 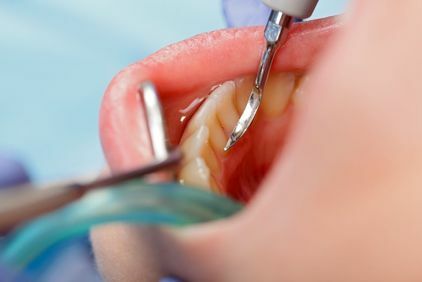 Once the bacteria have been adequately removed, he will use a planing device to smooth the root surface below the gum line to minimize pockets that can trap food and bacteria. This treatment also allows the gums to fit tighter around the tooth to help prevent further bacteria from reentering. If Dr. Van Slate finds that a patient has developed periodontal pockets, he can treat them by administering ARESTIN®, an antibiotic that slowly releases minocycline hydrochloride over time to continually eliminate bacteria. For more advanced cases, additional periodontal treatment may be necessary. To help keep your gum disease in check, Dr. Van Slate may recommend regular follow-up visits and cleanings more frequently. If you are experiencing the beginning stages of gum disease, it is imperative to see a dentist as soon as possible to help prevent further damage from occurring. To schedule your consultation with Dr. Van Slate, contact our office online today or call (713) 783-1993.